“Diamond in the Rough” from Christian Faith Publishing author Joyce Byers Hill is an inspiring novel introducing the reader to Meghan, a strong and determined mother, and Travis, the town’s new pastor with a secret. This captivating story will remind the reader of God’s grace and healing powers. “Diamond in the Rough”: a captivating and inspiring novel about perseverance, human potential, and God’s healing powers. “Diamond in the Rough” is the creation of published author, Joyce Byers Hill, a devout Christian, mother and sales analyst with a passion for creativity. Published by Christian Faith Publishing, Joyce Byers Hill’s new book introduces Meghan, a strong and determined mother to daughter Kaci. Meghan wouldn’t have survived the divorce without the moral support of Kaci. Even though Kaci had never been a problem, it wasn’t easy for Meghan to raise a teenager alone. The real problem was not having enough hours in the day, as Meghan worked extra to try to save enough to fulfill the dream of building a home. Meghan had not yet met the new pastor in town, as church attendance had been placed on the back burner. Travis Harmon, the new pastor of Hope Community Church, had a secret. Only the head elder was aware of the inner turmoil Travis suffered. Travis had a gift for leading souls to Christ, but could the pastor be forced to give up the ministry? Could Travis’s tortured heart ever be healed? This is a story of God’s healing power. God looks past flaws and weaknesses and sees potential in all people. The Almighty looks at one’s character, one’s soul, through the loving eyes of a parent. With hard work and a little bit of polishing, anyone can shine like the brightest diamond. View a synopsis of “Diamond in the Rough” on YouTube. 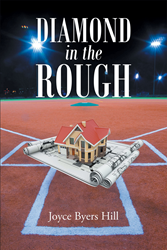 Consumers can purchase “Diamond in the Rough” at traditional brick & mortar bookstores, or online at Amazon.com, Apple iTunes store, Kobo or Barnes and Noble. For additional information or inquiries about “Diamond in the Rough”, contact the Christian Faith Publishing media department at 866-554-0919.